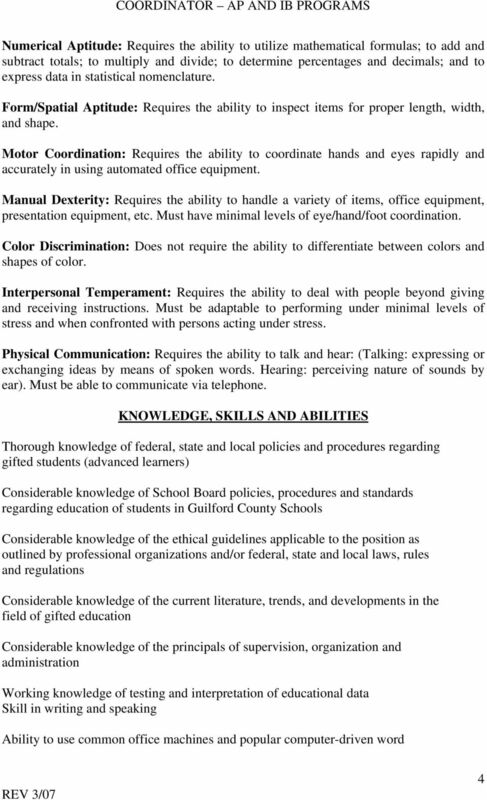 Download "GUILFORD COUNTY SCHOOLS JOB DESCRIPTION JOB TITLE: COORDINATOR AP AND IB PROGRAMS CURRICULUM AND ORGANIZATIONAL DEVELOPMENT GENERAL STATEMENT OF JOB"
1 GUILFORD COUNTY SCHOOLS JOB DESCRIPTION JOB TITLE: COORDINATOR AP AND IB PROGRAMS CURRICULUM AND ORGANIZATIONAL DEVELOPMENT GENERAL STATEMENT OF JOB Under limited supervision, performs a variety of supervisory and administrative tasks in overseeing and monitoring services and programs for the Advanced Placement Program and the International Baccalaureate Diploma Program. 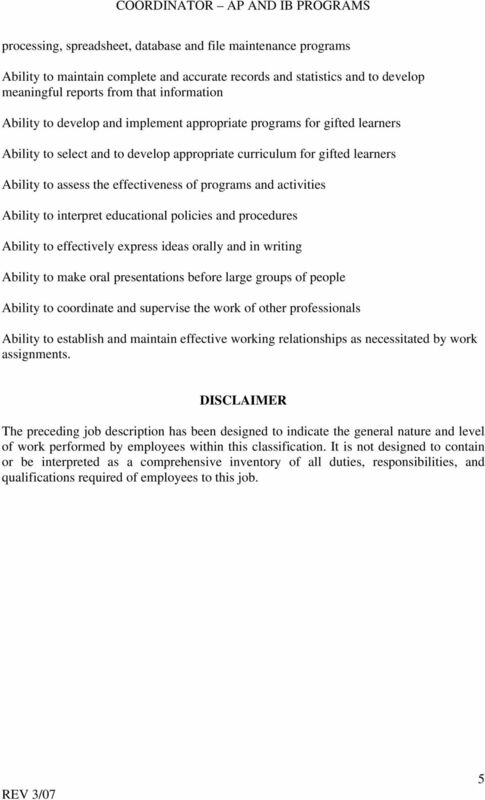 This position serves to enhance the effectiveness of the educational process for gifted students through the implementation and administration of the Advanced Placement Program, the International Baccalaureate Diploma Program, and other special opportunities offered to this population of students. Employee oversees the implementation of these programs, monitoring their effectiveness, providing staff development opportunities, and ensuring adherence to federal, state and local policies and procedures. 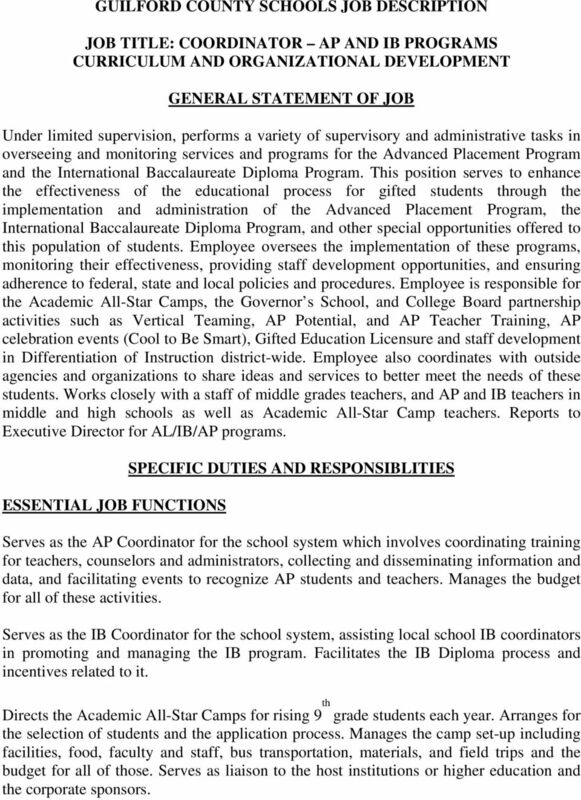 Employee is responsible for the Academic All-Star Camps, the Governor s School, and College Board partnership activities such as Vertical Teaming, AP Potential, and AP Teacher Training, AP celebration events (Cool to Be Smart), Gifted Education Licensure and staff development in Differentiation of Instruction district-wide. Employee also coordinates with outside agencies and organizations to share ideas and services to better meet the needs of these students. Works closely with a staff of middle grades teachers, and AP and IB teachers in middle and high schools as well as Academic All-Star Camp teachers. 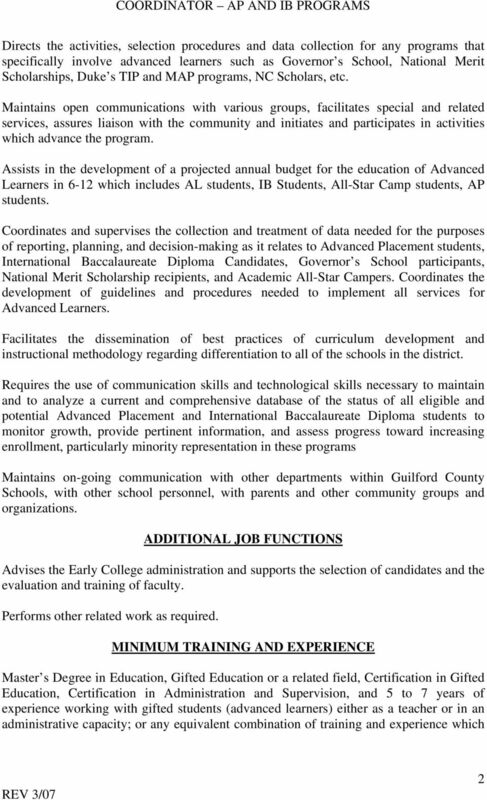 Reports to Executive Director for AL/IB/AP programs. 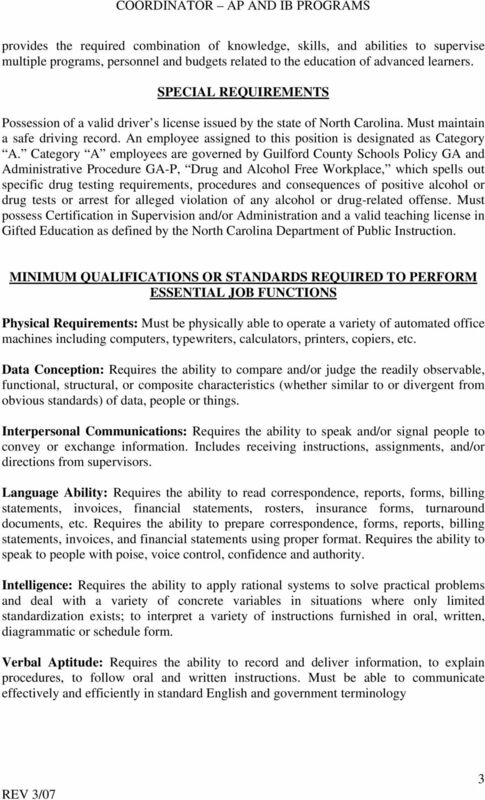 ESSENTIAL JOB FUNCTIONS SPECIFIC DUTIES AND RESPONSIBLITIES Serves as the AP Coordinator for the school system which involves coordinating training for teachers, counselors and administrators, collecting and disseminating information and data, and facilitating events to recognize AP students and teachers. Manages the budget for all of these activities. Serves as the IB Coordinator for the school system, assisting local school IB coordinators in promoting and managing the IB program. Facilitates the IB Diploma process and incentives related to it. Directs the Academic All-Star Camps for rising 9 th grade students each year. Arranges for the selection of students and the application process. Manages the camp set-up including facilities, food, faculty and staff, bus transportation, materials, and field trips and the budget for all of those. Serves as liaison to the host institutions or higher education and the corporate sponsors.